Over the past few years I’ve done more wedding flowers for barn weddings than any other type of venue. Their “blank canvas” laid back appeal go hand in hand with the sort of naturally styled wild flower wedding designs I like to create. With more and more couples choosing to get married in non-traditional spaces, this trend looks like one that is going to stay. 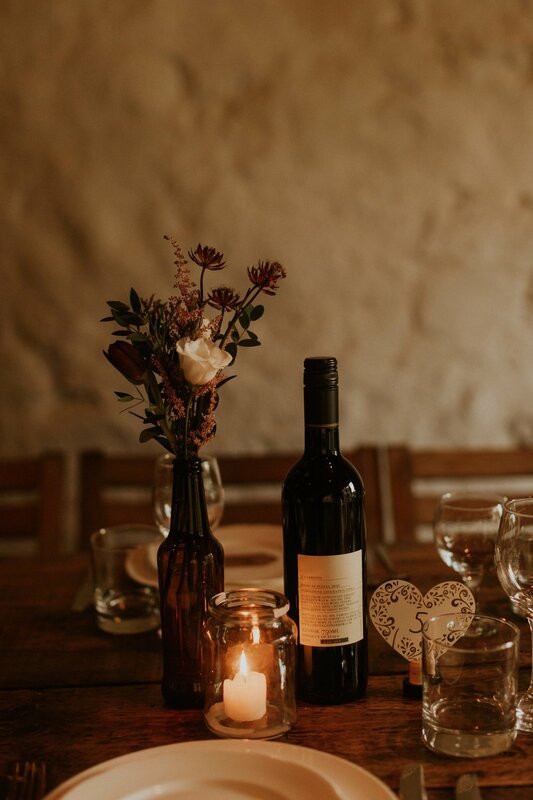 For all the freedom a “dry hire” space offers it can be a bit intimidating to plan what to do with all that space and choice so I’ve put together a few things to think about if you’re planning a barn wedding and are thinking about wedding flowers. Barns and byres are often pretty large spaces, some venues are quite flexible about what you do to the space and will allow you to add in hooks to hang wild flowers or other decor if necessary but always check first. Barns are great for creating dramatic hanging floral designs that make the most of negative space and can really frame a ceremony or become a talking point. Equally, smaller designs like jam jars with wild flowers will look much smaller in a larger space than they do in your trials on your kitchen table. Unless they are clustered or you have hundreds of them they can get lost. Consider bringing your colours up in the space by using hanging pieces such as floral hoops, branches or foliage garlands. Sometimes it’s worth revisiting your venue with your “decor” hat on, looking at it differently from when you first viewed it will help you decide how you want to decorate it, and how feasible some of your ideas are. As wonderful as barns may be, they are often not blessed with many windows. This is great if you are going for a cosy atmosphere with candles and fairy lights but it does mean that some colours of flowers will struggle to stand out in the gloom. Consider including some lighter tones to your flower colour palette to lift designs and stop them from receding into the shadows. On the plus side barns are also not often furnished in the same way that hotels or churches are so you don’t have to worry about your colour scheme not matching the carpet or curtains. There are often interesting original features or bits of architecture that you can highlight or bring to life by dressing them with flowers, think about feeding troughs, milk churns or old farm machinery. If you are struggling for budget consider where your photos are likely to be taken and prioritise these areas for flowers as they will have the biggest (and most lasting) impact. Look at where your photographer has taken photos at that venue before, search instagram for images from weddings at that venue to get inspiration and see how others have used the space. Having both your ceremony and reception in the same space makes life easy for your guests but it can be problematic logistically. If you want to re-use flowers from the ceremony in your reception check who is going to move them while you are mingling with your guests or getting your photos taken. The venue staff or wedding planner might be happy to do this but if not you may need to pay your florist to stay and oversee the change. On this point of “maneuvering” think about how feasible it is to move the designs – jam jars are easy, hanging pieces and arches are not. If you are having a band will they be able to use the space as it is or will the flowers need to be taken down? Also, who will take down the flowers the following day, your venue may not always be happy to do this so make sure you check first. People sometimes assume that a barn wedding will be cheaper than a traditional hotel or church wedding, but because it is very much a blank canvas and does not have its own décor it can take a significant amount of flowers to make an impact and stop it looking too bare or minimal. In spaces like these, wedding flowers come into their own, really transforming a venue and making it unique to that couple. When you are planning your wedding flower budget take into account you are really budgeting for more than bouquets, but decoration and styling for the whole space and the time it takes for your suppliers to create this effect. 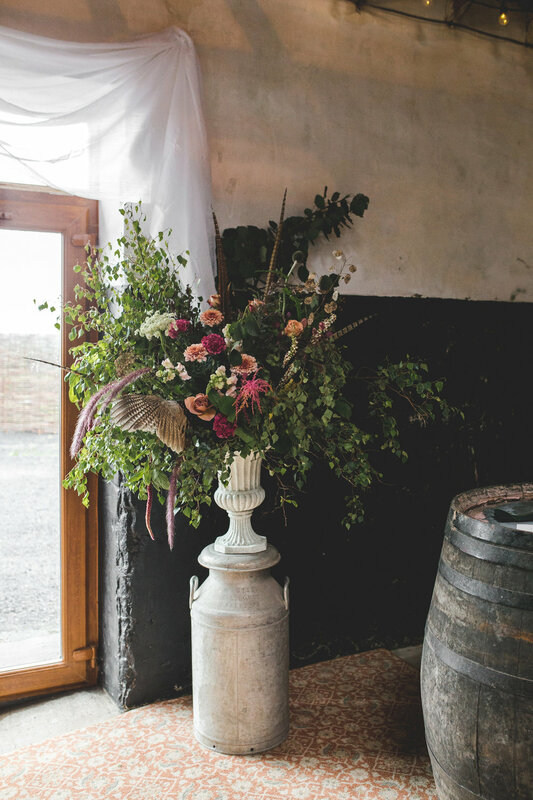 With a hotel, castle etc this style and colour has largely already been set and dictated by the décor of the venue but in a barn your choice of wedding flowers will have a big impact. Ultimately a barn wedding is great because you can really make it your own. If you are looking for inspiration have a look at my wedding flowers gallery for inspiration in places like Harelaw Farm, Crear and Dalduff. If you’d like to talk about your ideas for a barn wedding get in touch.